Goubuli Baozi (狗不理包子) has come to Singapore! 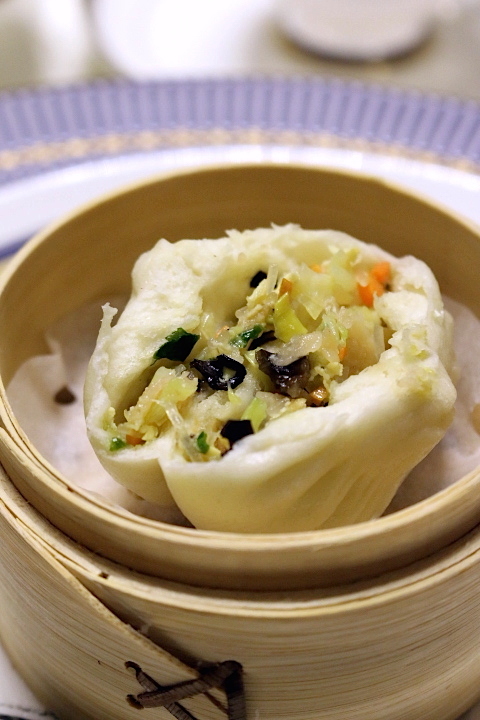 The time-honoured Tianjin steamed buns have been sought out by travellers to China and served to visiting diplomats and celebrities, but have never had an overseas branch until now. 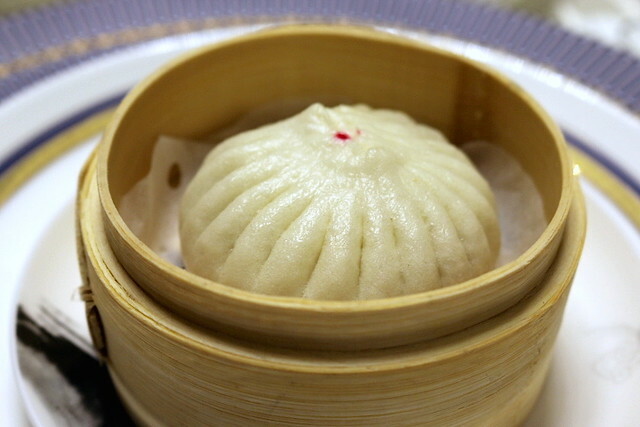 The delicate handmade steamed buns are are made with half-leavened dough, pleated with 18 folds or wrinkles (like xiaolongbao) and contain soupy meat fillings (like xiaolongbao too). The brand harkens back to 1858, when founder Ah Gou started a very successful business selling these buns. He was so busy or engrossed in making those buns, that he would have no time to chitchat with customers. Hence people would start calling him "Goubuli" meaning "dog that ignores". A complaint and yet a catchy name at the same time. So now, more than 150 yers later, Goubuli has found fancy digs in Marina Bay Sands. 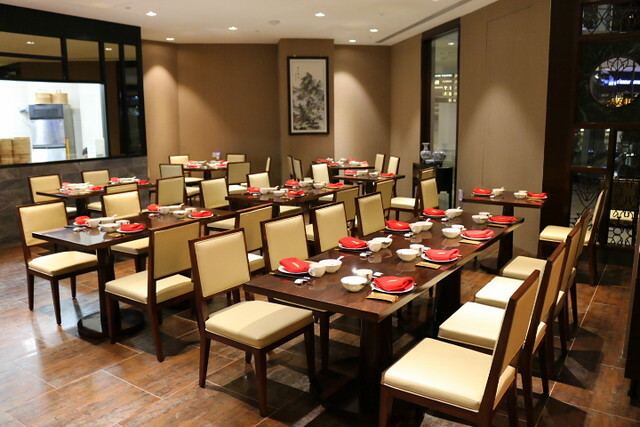 The outlet called 9Goubuli (the 9 is just an auspicious number added to set the Singapore branch apart) has a main dining area and three private rooms. It is near the end of the mall where Todai is. 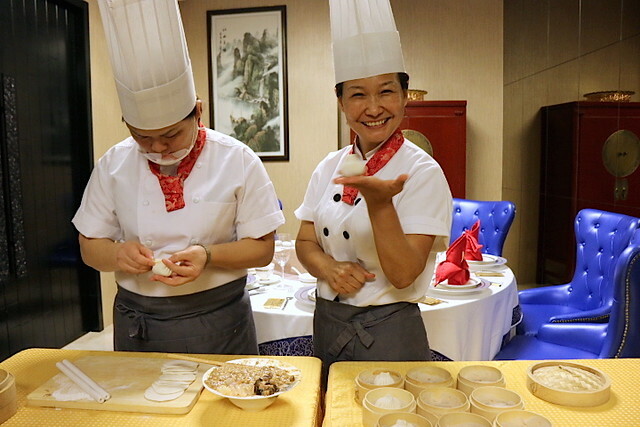 In the Singapore kitchen, we have Baozi Master Chef from Tianjin - Chef Wang Chuan Ping (right) - who is the seventh generation baozi Master and has been perfecting her skills for the past thirty years. They use a combination of three specific flours sourced from Australia and Canada (grains grown in dry and to get that consistency. The pork is all hand-chopped, so that they are moist, and don't get mushy. However it isn't just baozi they sell here. In fact, the menu is pretty diverse with a little bit of everything - Cantonese, Sichuan, Shanghainese and even Beijing dishes. Executive Chef Koo Kowk Fai who specialises in Cantonese dishes has a team of chefs preparing dishes such as ‘chilled salted duck’, ‘stir-fried egg whites with scallops in truffle oil’, ‘double boiled bamboo pith with bird’s nest’, and more. 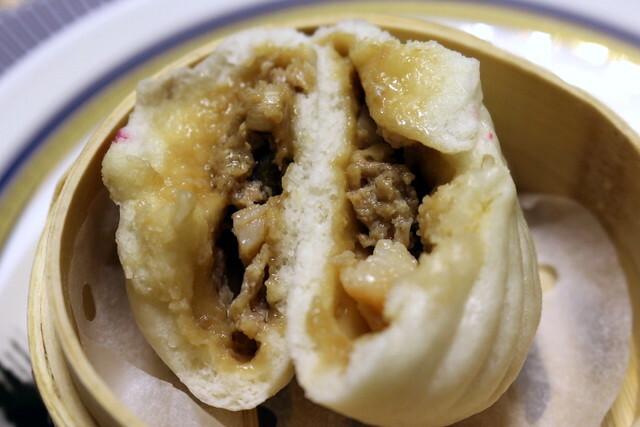 But first, we must try the signature baozi, right? OK, they have a traditional bun with just meat (S$2.20/piece), but this is the one with seafood and vegetables added in (极品三鲜包). You can see the bits of shrimp and maybe scallop in this. It's supposed to be premium ingredients and even nicer. However, with all my heightened expectations of the Goubuli buns, I have to say this was not my fantasy baozi brimming with ingredients. And somehow, the seafood addition did not enhance the meat but seemed to dilute the flavours instead. I must come back and try the regular meat-only bun to see how it compares. I do love the dough skin, especially that softly chewy texture that is way more interesting than the usual fluffy cotton-like bao skin. Goubuli's dough skin thin and yet resilient enough to absorb gravy and hold its shape. Oh this was surprisingly delicate and delightful. The gravy is just lightly savoury, and the natural sweetness of the vegetables and their crunch made each bite refreshing. Vegetarians have a great option here. Now this was the potent one. You peel open the bun and can smell the aroma of the wagyu! The coarsely chopped cubes in the rich gravy have a good bite to them. It's a nice mixture of A3 and A4 grade marbling, so it isn't excessively fatty and has enough beefy flavour for balance. This was excellent. Quality fish maw in a rich stock made from boiling whole chicken and duck under high heat. Carrot gives the soup its golden tinge, and chopped coriander (served separately) adds fragrance. The hot stone pot kept the soup bubbling hot too, so enjoy this slowly. The restaurant uses cod fish for this version of 水煮鱼 and the buttery rich flesh does go well with the dried chili and Sichuan peppercorn flavours. However, it's clear the spicy heat has been toned down for the local palate. But good news then, for those who can't take chili heat well, or those who don't believe in extreme chili heat obliterating all other flavours. Oh this was my favourite dish of the evening. When I saw 辣子鸡 on the menu, I was so happy. I just had to try it. This was deliciously addictive all right - crispy yet juicy bits of chicken well-seasoned and fried - but again, this is nowhere near true Sichuan style tongue and lip numbing spiciness. That's fine; it means I can bring my two little kids to try this. 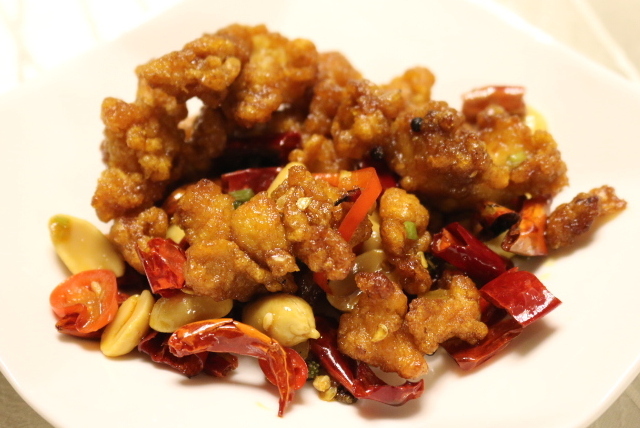 They love spicy food, and this is a great way to get them to work their way up the scale. This is not on the menu, but it was cobbled together from two items on the menu. 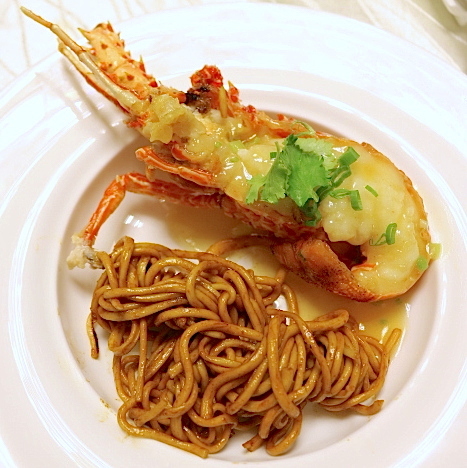 The humble fried La Mian (hand-pulled noodles) gets a super upgrade paired with the Baked Half-Lobster. Both were expertly done. I really liked the simple noodles, and the lobster was clearly fresh, springy and juicy. A pretty modern dessert, but nicely done. 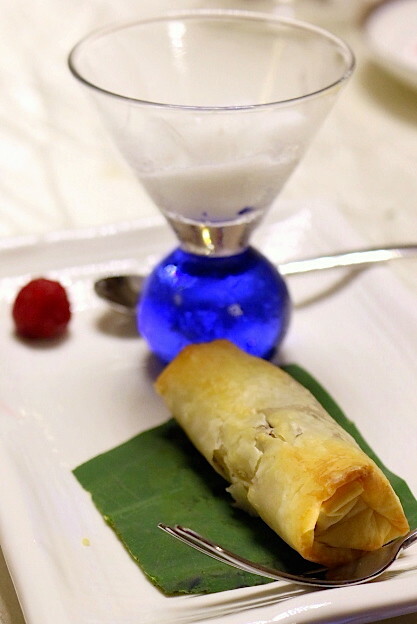 The comforting combination of banana and chocolate in baked filo pastry plays with creamy and crispy contrasts, while the sorbet-like ice cream adds a sweet cold jolt to the warm spring roll. 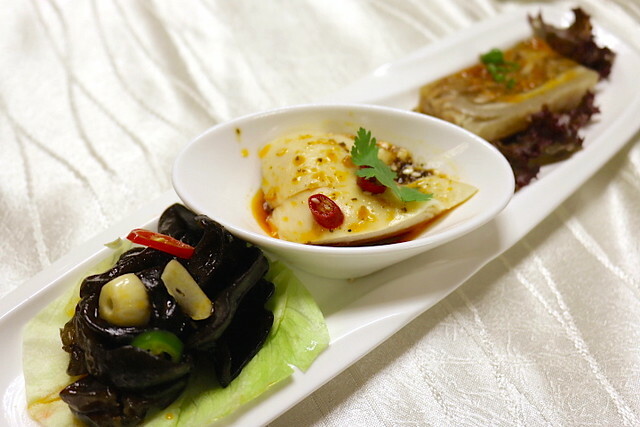 The 9Goubuli menu also covers homemade noodles, seafood, meats, dim sum and rotisserie, including classic Cantonese roast items and even Peking duck, thanks to Executive Chef Koo's 25 years in Cantonese cuisine. 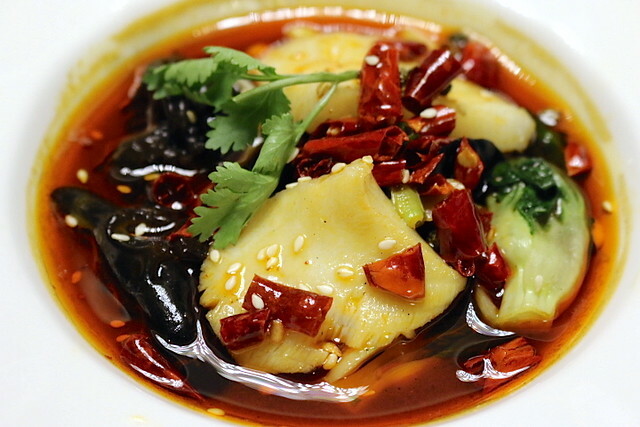 Goubuli in China has more than 20 restaurants with various specialties - some do baozi, some purely appetisers, and yet others are fine-dining establishments with Beijing and regional specialties. The 9Goubuli restaurant in Singapore showcases a little of each of these to let us try what they have. 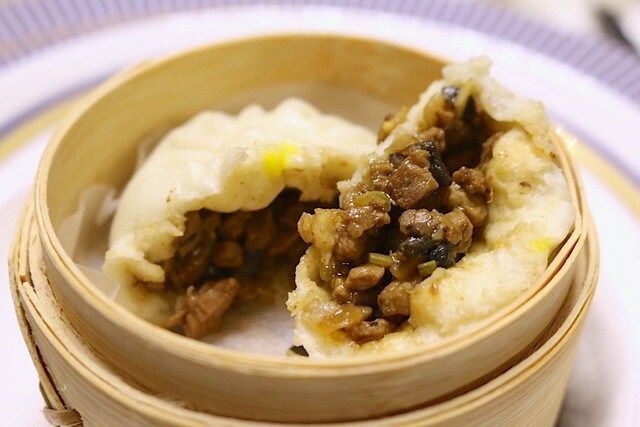 While I would rather they focus on just doing the baozi or just a small menu extremely well, they do have some notable items in the regional dishes and cold appetisers. The wide-ranging choices and accessible prices also make it easy for families and large groups to come and eat together.